In this post, I’d like to show you how to convert video clips recorded with Panasonic camcorders to iPad compatible video files, so that you can easily move your movie shots onto iPad. The only tool you need is Video Converter Mac App. It fully supports converting Panasonic HD camcorder captured AVCHD MTS/M2TS video files. Besides, the optimized profiles in this Mac Video Converter App include iPad H.264 HD Video. So you can still enjoy your great shots in high definition. 1. 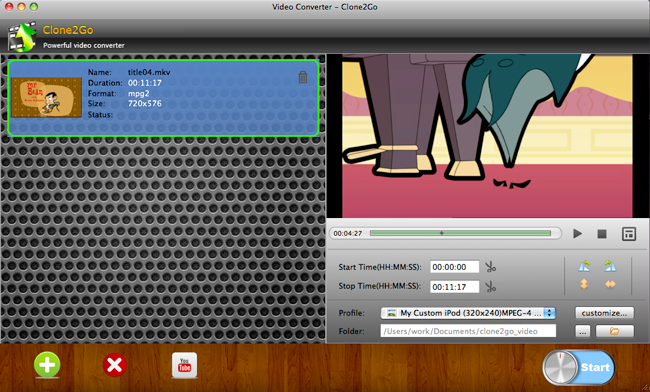 Transfer the videos files (MTS/M2TS) shot with your Panasonic HD camcorder to your Mac. 2. Download and install Video Converter App onto your Mac. 3. Click the “+” button to import the MTS/M2TS video files into the program. 4. Extend the “Profile” drop-down list and choose “iPad” from the category. 5. From the subcategory, choose “iPad H.264 HD Video” as the output format. 6. Click the “Start” button to get the conversion started. 7. After the conversion, click the “Folder” button to get the output files. 8. Connect your iPad with your Mac. 9. Launch iTunes. Click “File -> Add File to Library…” or “File -> Add Folder to Library…” to import the output files into iTunes library. 10. Transfer the output files to your iPad with the sync of iTunes. 11. Now you can enjoy the recorded videos on the big screen of your iPad.